Italian artist and tattoo master Michele Servadio produces his figurative, dark imagery through a set of bold and dense actions. His art revolves around the life of humans in a post-industrial society and a post-shock culture. Regardless whether he portrays humans or industrial landscapes the artist always aims to avoid idealization and portray true raw emotion and discover hidden significance in seemingly irrelevant spaces. Michele Servadio was born in Italy in 1986. He grew up in the town of Asiago on the Alpine plateau in the countryside of Veneto. It was in Italy that he obtained extensive art education, first when he enrolled into the Art School in Padua and later on when he continued his education at the University of Visual Arts in Venice. Fascinated by the tradition of tattoos and its place in many ancient and tribal cultures Servadio begun his tattooist career and quickly become one of the key figures of the underground art and music scene. In his studio entitled Hackney Wick Servadio often experiments with various art genres such as tattoo, printing, printing and sound. 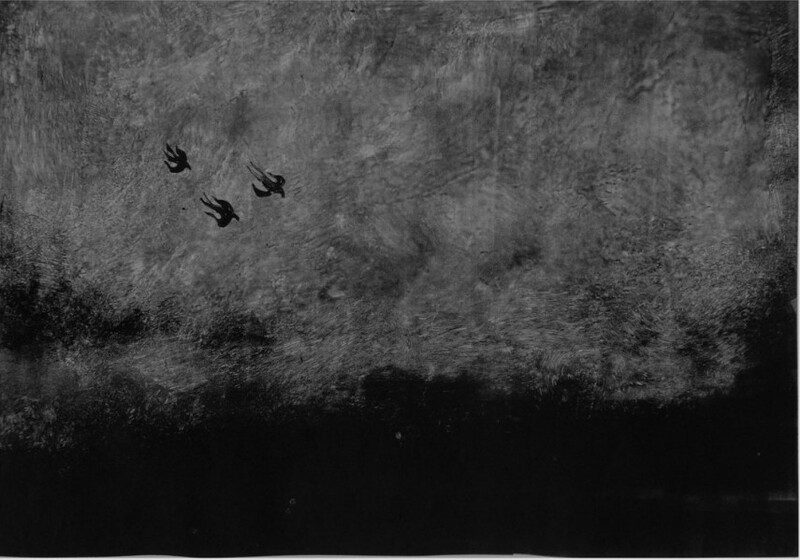 His work is dominated by black and often related to dark imagery. In 2014, Servadio created a Grabato experiment better known as Body of reverbs. In this famous project, the artist combined tattoos and sound that creating a ritualistic performative artwork resembling tribal tradition of the past. Between January and May 2014,he created Raw Humans series of prints. The series that explores the existence of humans in the post-shock culture is composed of an array of black and white portraits depicting distorted images of the human physics. Following the mantra “beauty is harsh and raw” Servadio used conspicuous strokes and a limited color palette to avoid the trap of idealizing the human body but rather focused on pushing the subject matter to its true physicality. 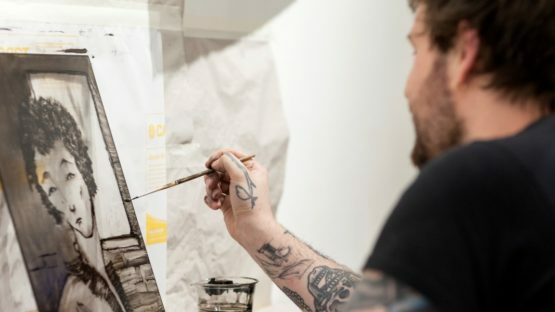 In the year of 2015, the artist created Sizing Grounds new series of monoprints that explore the connection between decay and beauty while he juxtaposes physical objects alongside ready-made surfaces, textures, and patterns. 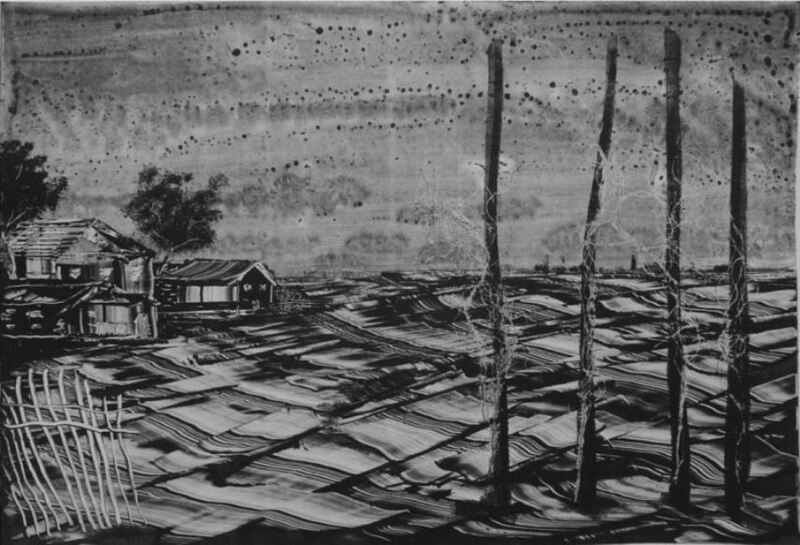 The series inspired by the landscape of an old factory Hackney Wick in East London depict the artist’s propensity to seek and find a hidden meaning in a seemingly disengaged environment. 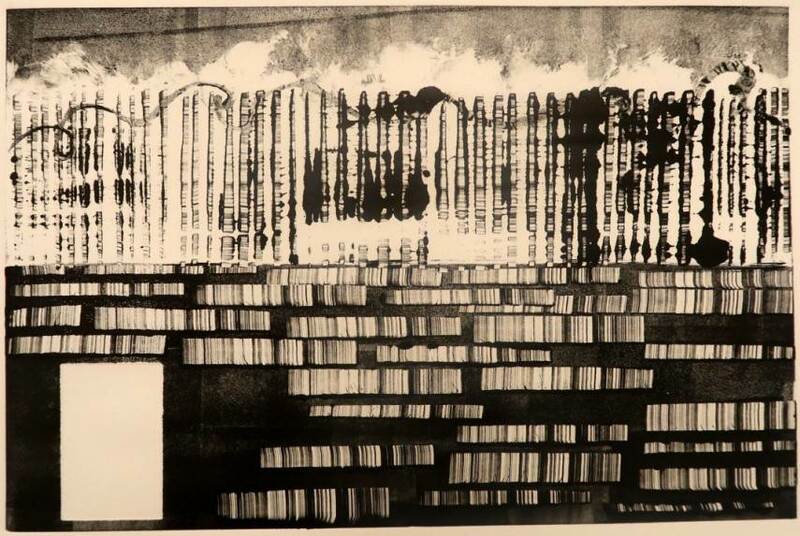 He was inspired by the man-made industrial landscapes and then manipulated them to create a compelling set of monotypes. Michele Servadio uses a variety of objects including ropes, glass, wires and metallic shards to manufacture meaning amid complete utility. He creates the sense of division though a mark-making process that produces various degrees of separation between objects. In 2015 Servadio, joined forces with fellow creatives RUN, Borondo, and an art trio Canemorto. The collaboration resulted in a set of new, original ink on paper monotypes that were on view at Colera group show and completely covered up the space of Galleria Varsi in 2017. Tattoo and fine artworks by Servadio were exhibited in London, Berlin, Lucern, Rome and many other cities around the globe. Michele Servadio is represented by Galleria Varsi.